Do you get excited the moment you see an ad for Homebase or walk past a Habitat? While daydreaming about redecorating my home, I figured I'd start small. That meant it was time to spruce up my home office desk space! It's where I spend the most time after all. 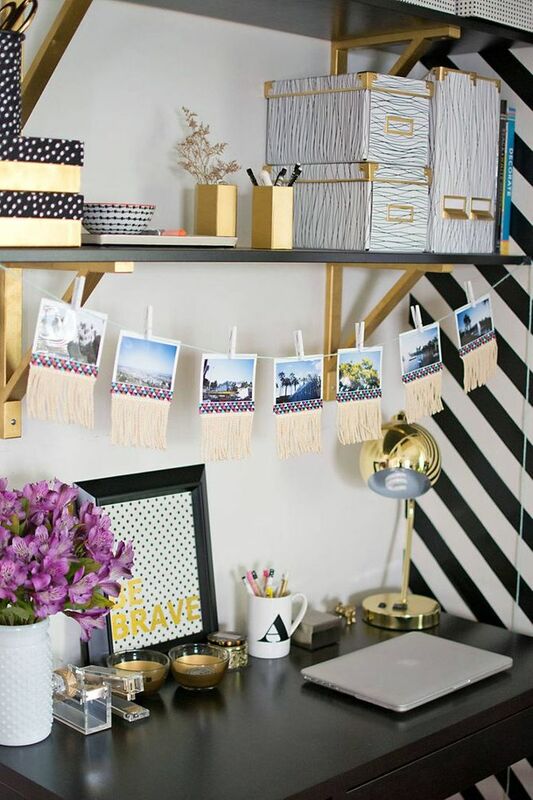 If you're like me and need just a little inspiration to kick things off, check out these 22 genius decorating ideas to transform that dull home office of yours. It's time to get creative! A beautiful workspace is key to a beautiful day's work right? 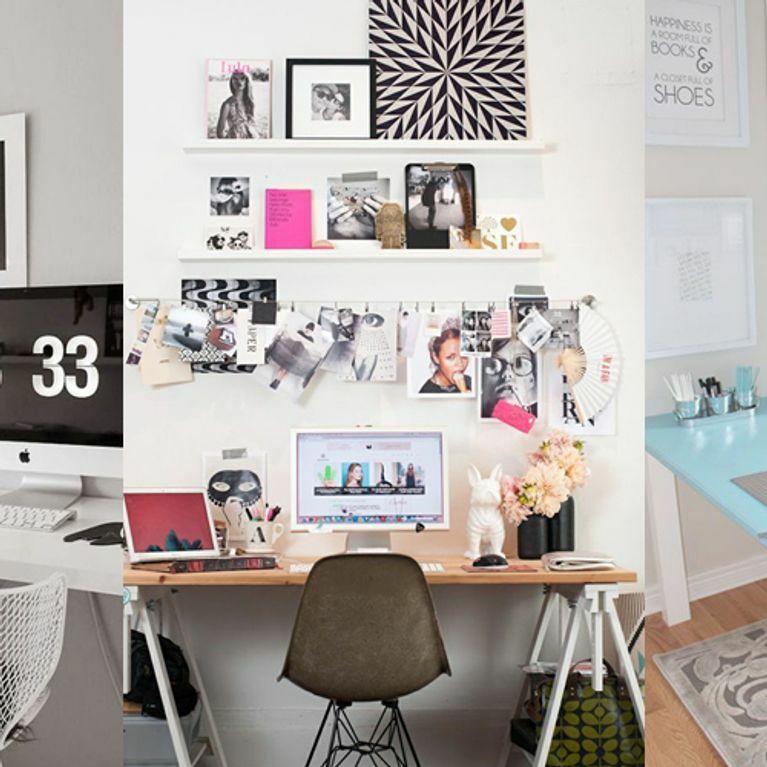 So before you even turn on your computer, why not spend some time perfecting your home office with some of these inspired decoration ideas? I love shiny things so naturally I adore this silver desk. As much as I'd like to tap away on a typewriter, it just ain't going to happen these days. Still, even with a laptop in its place, this workspace screams old school chic. I love, love, LOVE the blue top desk and chandelier. It's the perfect way to add intrigue with a touch of elegance. The polka dot chair gives this office just the right drop of fun. I'm a fan of the clean and muted colors otherwise. If you live in a tiny NYC apartment (spoiler alert: they're ALL small), you get the importance of space conservation AKA the necessity of storage. This setup allows you to have a home office and keep your private items out of sight. How beautiful is this art deco rug? I think it truly elevates the room without being too overpowering. Inspiration upon inspiration. Keep all the things that get your creativity going within reach and eyeshot. No, seriously, how cute is this sewing station? The amount of light that's entering this room is utterly refreshing. There's no need to make much fuss. Sometimes a multitude of colors can be too distracting. Keep it cute with black and white. Oh, just another sewing workspace that's making me think I should begin making my own clothes. Thanks, a lot! And there it is, like a bolt of sunshine. Keep it classic with wood elements, but modern with two monitors. The more the merrier, right? This is also inspired by Kate Spade, which is a fave of mine. So naturally I'm now taking notes. There's a lot going on here yet it's all so organized. I find myself gravitating towards this very contemporary design. A gal can't ever have too many framed images, can she? This desk space is more like a full room experience. Its beauty knows no bounds! Gotta love the extra storage! Only have a tiny corner in the room to work? Make a big statement with bold art decor. Chalkboards are great visually and totally functional when it comes to jotting down random thoughts. A clear seat is just that little bit of oomph you need when finishing up the decor in your office. Yes, there's even room for the children to do their homework! If you're more into deep hues, take style cues from this perfectly purple desk space. More Inspiration Right This Way! Where do you go for home decor inspo? Tweet us @wewomenUSA!